THE INDIAN PHILOSOPHY IS ENRICH WITH THE THOUGHTS OF GREAT ACHARYA TRIO SRI SRI SHANKARA, SRIMAD RAMANUJA & SRIMAN MADHVA. THOUGH THE DIMENSIONS OF THEIR TEACHING IS DIFFERENT THE PATH AND THE GOAL IS THE SAME. THERE IS NO CONTRADICTION IN THEIR STATEMENT IF UNDERSTOOD PROPERLY. The word “Manisha” means “conviction” and “Panchakam” means a collection of five. The central theme of Vedanta is to show the oneness between Jivatma and Paramatma. Sri Sri Shankara in this short composition of five verses brings out this essence of Vedanta with conviction. There is a traditional story connected with the composition of these verses. 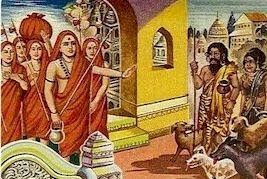 One day Sri Sri Shankara along with his disciples, after having a bath in the Ganges at Kashi was on the way to the temple walking through one of the narrow lanes. Suddenly he saw a Chandala (lowly caste person) walking opposite to him. As per the practice and customs prevailing in those days, Sri Sri Shankara beckons to the Chandala “Move Away Move Away”. At such a beckoning from Sri Sri Shankara, Chandala very humbly, yet poignantly lashes out a few questions containing the Ultimate Truth of Vedanta. Immediately Sri Sri Shankara realises the presence of Lord Shiva before him and reels of five verses revealing the wisdom of the Vedas as lived and experienced by him in his direct insight. These five verses have come to be known as “Manisha Panchakam”. Could the all knowing Sri Sri Shankara who is the foremost profounder of Advaita Vedanta react thus seeing a Chandala? Has this legend been just interwoven to the main composition (“Manisha Panchakam”) to serve as a lesson by somebody to erase the then prevailing atrocious social dogmas? Was the Sri Sri Shankara not yet a fully realized when this event occurred? Well, a highly debatable topic. Nevertheless, these argumentation will not result in any beneficial outcomes and will not serve any good purpose. Our aim is to learn and develop firm faith in Vedanta. With this as the sole purpose let us see the composition giving less importance to the stories around it. Gamane = was on a stroll. Once, a great godly man is on a stroll in the famous, heavenly place – the Varanaasi. During his walk after his ritualistic, sacred and purified bath he came juxtaposed to two people – a man and his consort walking opposite to him almost bumping into his way. The strange couple were none other than The LORD SHIVA and PARVATHI. Gachcha = Get away.. You…. Punah praaha = In reply said as follows…. yativara dooree kartum vaanchasi kim broohi gachcha gachchaeti ? Yati vara = O! Best among the learned! Gachchaeti = Get away etc…. Dooree kartum = keep at a distance, keep aloof ? अयम् श्वपचोयमित्यपि महान् को अयम् विभेद भ्रमः? ಅಯಮ್ ಶ್ವಪಚೋಯಮಿತ್ಯಪಿ ಮಹಾನ್ ಕೋ ಅಯಮ್ ವಿಭೇದ ಭ್ರಮಃ? ayam swapacho ayamity api mahaan ko ayam vibhaeda bhramah ? avabodha = This is the perfect understanding. Chandala continues his query: Isn’t the indwelling essence in all of us the same wave-less and steady ocean called the innate and natural Bliss Absolute; While this should be the perfect understanding of the learned, (for you too) O! Great soul, why is this (indeed hatred inducing) illusion of discrimination (that) one is learned and a Brahmin and that the other one is an outcaste and is untouchable! poorae vaa antaramasti kaanchana ghatee mritkumbhayorva ambarae? The precious jewel of the sky, the Sun, isn’t he shining in the same way in this very sacred and holy waters of this river - the mother Ganges and in the polluted cesspools there in the dirty lanes of the outcastes? Will the reflected sky be inferior in an earthen pot, compared to the one in a golden vessel ! Aren’t the Sun and the Sky absolutely the same without any difference? These very pithy and piercing arrows of questions from Chandala posed to the mind of Sri Sri Shankara, the nija swaroopa of the Chandala (Lord Shiva in the disguise) is perceived by Sri Sri Shankara and the following 5 slokas form the firm conviction and understanding attained by Sri Sri Shankara. chandaalostu sa tu dwijosthu gurur ityaeshaa maneeshaa mama. asthu Dwijo = may be he is a learned (Brahmin). Gurur iti = is the real preceptor. Oh! Let’s learn that the indwelling (pratyag) atman is distinctly shining with in all the three states; namely the wakeful, the dreaming and the deep sleep states. It is the invisible thread embedded in us and it is the witness with in all from the Creator up to the tiny ant. It is not a cognizable object in spite of any amount of material intelligence. It is very much the same in one and all irrespective of any caste, creed or kind! My firm understanding is that the great one who inculcates this concept is the real preceptor. chandaalostu satu dwijostu gurur ityaeshaa maneeshaa mama. vistharitam = is perfectly unfolding itself. mayaa = by me (to be diverse). I am none other than a part and parcel of the Brahman (The Absolute). I am dwelling on the pure and infinite Brahman and I am the very Brahman. This universe is glittering with infinite glow by the power of the chaitanya or unlimited sentient energy of the Absolute. Apparently the universe is assumed (by us) to consist of diverse and different things, due to (our) ignorance (avidya or nescience) borne out of the three gunas (Sattva, Rajas and Tamas). He who firmly believes with perfect understanding of this unity in diversity, for me, he is the adorable great Master, irrespective of whether he is a Brahmin or an outcaste. This is my perfect understanding. praarabdhaaya samarpitam swavapur ityaeshaa maneeshaa mama. Guror vaacha = proclamation of the Lord. santa atmanaa = peaceful and tranquil intelligence. bhaavi cha = and to future (and present too). sam vinmayae = is the one of best understanding. maneesha mama = is my firm conviction. This entire universe, apparently continuing, is perishable and impermanent as per the decisive proclamation of the Lord. The Brahman, indeed, is permanent, everlasting and is undifferentiated and peerless, if one analyzed carefully with an untainted, unaffected, peaceful and tranquil intelligence. The differences in our physical bodies are the products of imprints of all our previous sinful/good deeds, pertaining to the past, present and future. The one who perfectly reduces these imprints to ashes in the flaming fire of knowledge is the best informed. This is my perfect conviction. yogee nirvrithamaanaso hi gururithyaeshaa maneeshaa mama. sphutaa = very clearly grihyatae = is perceived Aham iti = as the 'I' Anthah = within thiryangn = all the animals, nara = the human beings devathaabhir = and the gods too. aksha = eyes etc., sense organs. nibham = concealed by the clouds (caused by the sun). Maanaso hi = verily in his mind. The Self or pure consciousness is experienced clearly within by all animals, human beings and the gods alike as the 'I'. It is by the reflection of this pure consciousness that the mind, sense organs and the body which are insentient, appear to be sentient. External objects are perceived only because of this. This Self is, however, concealed by this very mind, senses and body which are illuminated by it, just as the Sun is concealed by the clouds. A person of perfect realization and wisdom due to his complete and clear understanding ever meditates in his mind on this supreme consciousness. Such a person is the real preceptor. This is my perfect conviction. Sakra adayo = the Indra and other celestials. brahmaiva = is the Brahman itself. surendra = by the Indra (and all other gods). maneesha mama = this is my firm understanding. The Self (Brahman) is the eternal ocean of Supreme Bliss. A minute fraction of this Bliss Supreme is adequate to satisfy the Indra and other celestials. Only by meditating with a perfectly calm mind on this Bliss Supreme, and not by any other special means, the sages experience adequate fulfillment. Whose intellect is ever unified with the eternal ocean of this Bliss Supreme, he is not a mere knower of the Brahman, but he is the Brahman itself. Such a person, whosoever he may be, and no matter at all, his feet are worthy to be worshiped by the Indra and all other gods. Definite, this is my firm understanding. O! Lord, the three eyed one (who is the all knower of the past, present and future)! In the form of this physical equipment, the body, I am the servant of You and thus of all. In the form of the life principle with in me, I am the part and parcel of You and thus of all. In the form the soul, You are within me and similarly in every other being or animal or thing that I behold. I have arrived at this conclusion after thorough reflection in my intellect - illuminated by all the sacred texts. Very nicely placed. Thanks for the post. it is painful to pointout that caste discrimination still exists. If reservation Policy which was introduced to address this issue, could not set right this issue even after 65 years, there must be something seriously wrong with this Policy. Some alternative is to be introduced drastically, so that the whole country progresses and those economically backward irrespective of caste, creed or religion, are uplifted really. Country's progress and interest should be the priority and guiding principle. Who is the creator of reservation policy? Why is it implemented to our constitution? Who are the responsibility of that case? Note carefully that Shankara did NOT answer directly to the question posed by the Chandala. Instead he gave evasive replies and off the mark. Alas ! Shankara appears to have not understood advaita himself, but had he, then the vexed caste system would've been dead and gone long ago. Well! This Anonymous comment on December 22, 2017 is sourced in ignorance. To say that 'Shankara appears to have not understood advaita himself" is nothing but an ignorant statement. The VarNa system is not meant to beat your chest and declare 'You are a Brahmana, or Kshatriya etc.' The VarNa system is meant to lead an ethical and moral life for self development - that means engage in activities prescribed in the shAstra and avoid activities prohibited in the shAstra. The VarNa system is not meant to be to discriminate against other VarNas. The so called elite of India seems to have missed understanding the VarNa system. The VarNa system is legitimate, but its practice has been corrupted successively generation to generation. The person visiting Shankara is not an ordinary ChanDAla, but Lord Shiva Himself. An ordinary ChanDAla could not have challenged Shankara like described in the Panchakam. Here Shankara is offering his respects to Lord Shiva and concedes that one who has realized the Self, he has transcended the VarNa system. But one who is living in the world with the identification of body and mind, the VarNa system is 100% applicable to him or her - VarNa system for self improvement and transcend body/mind identification and VarNa system not for discrimination. I wish the author of this post could have, in the least, acknowledged the source from which it has been simply copied and pasted here. The attempt to spread the message of Manisha Panchakam is nice.